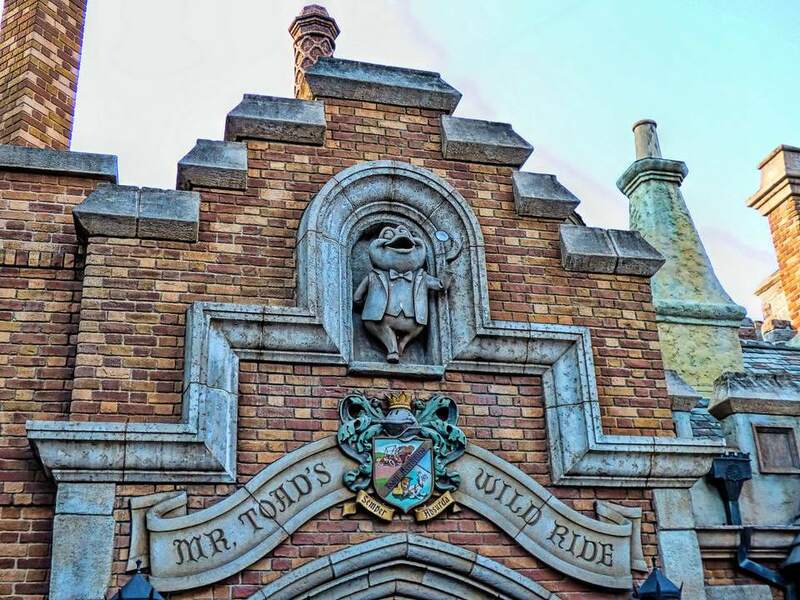 The Mr. Toad ride is based on the character from The Wind in the Willows. Riders accompany J. Thaddeus Toad, Esq., a poor driver who takes his passengers on a wild trip through scenes from the stories. Of all the rides at Disneyland, Mr. Toad (along with Roger Rabbit) is the most like being inside a cartoon. Mr. Toad is going "nowhere in particular," and riders get a glimpse of the toad's lavish mansion Toad Hall before they set off. It's not long before they're skidding through the house, crashing through walls and out a window. You'll avoid hitting a sheepherder and his flock (but just barely). Then things get even worse. Police are in pursuit. You're wondering why you ever got into the vehicle with the demented toad. And that's before you crash through scaffolding and ignite an explosion. Arrested and sentenced, you have to find a way to escape. We polled 248 of our readers to find out what they think about Mr. Toad. 85% of them said it's a must-do or ride if you have time. Location: Mr. Toad is in Fantasyland. Herky-jerky factor: Low in general, but there are a few sharp turns, which could aggravate neck and back problems. Accessibility: Wheelchairs and ECVs should enter through the exit. You'll have to transfer to the ride's cars. One of the final scenes is a fiery version of hell with puppet devils. You know your kids - skip it if this will scare them. This ride uses some strobe lighting effects. Avoid it if this is a problem for you. If you have time, check the titles of the books in the library, which include "For Whom the Toads Croak." 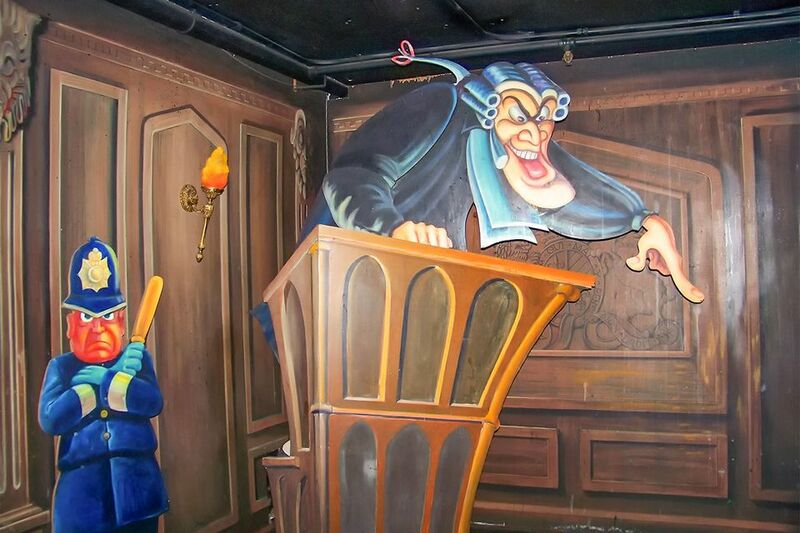 Touringplans.com says Mr. Toad is "at the technological basement of the Disney attraction mix." Don't go there expecting amazing modern effects. On days when the fireworks show is running, this ride closes early. Mr. Toad is one of the original Disneyland attractions that were in the park on opening day in 1955. Mr. Toad is one of the Disneyland rides that you won't find anywhere else. Florida's Magic Kingdom had a Mr. Toad ride when it opened, but it closed in 1998. Disneyland Paris has a restaurant named Toad Hall in Fantasyland, but no ride. Every voice in the film is done by the same person: Corey Burton. The ride vehicles are named after Mr. Toad and his friends: Toady, Badger, Cyril, Moley, Ratty, Weasel, and Winkie. According to a former cast member writing at Hidden Mickeys, they call the fiery scene The Inferno Room. He says: "You think we're allowed to say hell?" In case you're curious, the motto in Mr. Toad's family crest reads Toadi Acceleratio Semper Absurda which means "speeding with Toad is always absurd." And once you've been on the ride, you'll probably agree. Go wild taking photos of yourself and your friends in the ride vehicle parked outside the ride.